Mmmm don’t we all want juicy meat, well now you can with this very simple process. Brining is a simple process that make your meat exceptionally great. The first time I tried this was with a turkey at thanksgiving time, people just kept eating it and saying “this is the best turkey I have ever had, it’s juicy and delicious!”. Ok a simple brine is not the end all, we still need a little attention to detail in the preparation and the temperature you cook the meat to. Aside from the brine method the temperature is one of the most critical factors in cooking great moist delicious meat. If you are not sure about how to gauge temperature there are a lot of great gadgets out there to help the average jo be exceptional. My favorite has to be the probe thermometer, poke it in set the alarm and kick back with a brewski or a glass of wine and let it happen. I use this method quite often especially working with large pieces of meat like turkeys and roasts. Well lets pull together some ingredients for start the brine! 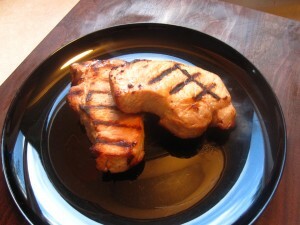 Note: the below recipe is for pork chops that are what they call Double or thick, the ones i picked up were delicious and approximately 1″ thick, some people slice them a little thicker or thinner depending where you’re getting them. Many times you can ask your butcher to do a custom cut to get exactly what you want. Most important you may want adjust your brine and cooking times for the thickness less for thinner more for thicker. Place the vinegar, sugar, salt and black pepper into a sauce pan boil until dissolved. Take sauce pan of heat add ice. Once cool to the touch place pork chops into a medium size bowl and pour mixture over. Brine for approximately 20-40 minutes turning the chops several times.